Though I love dancing and eating wedding cake, my favorite part of any wedding is the ceremony. No contest. 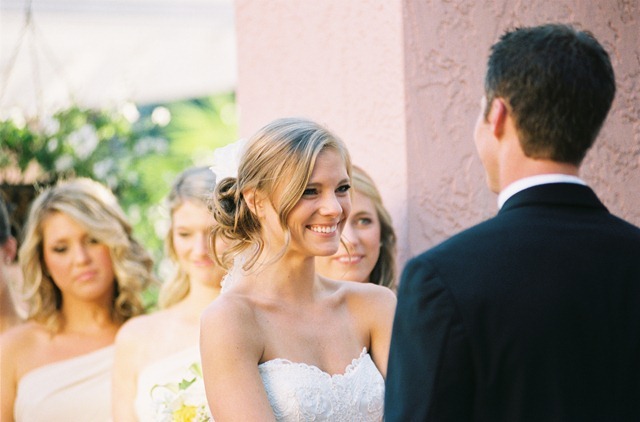 It’s during the ceremony when I feel like I get to experience the love between the couple. 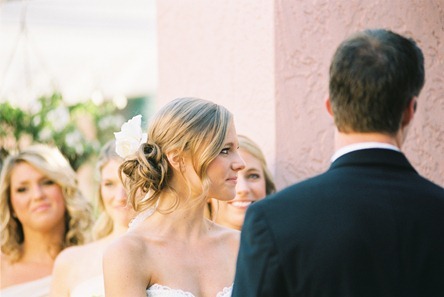 Watching the bride and groom as they promise to be together forever warms my heart. 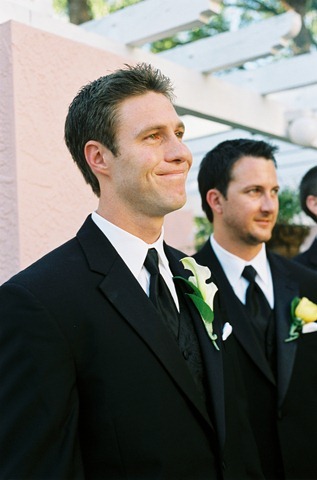 If the groom cries, I’m done. I’m crying like a baby until the couple walks back down the aisle, arm in arm. 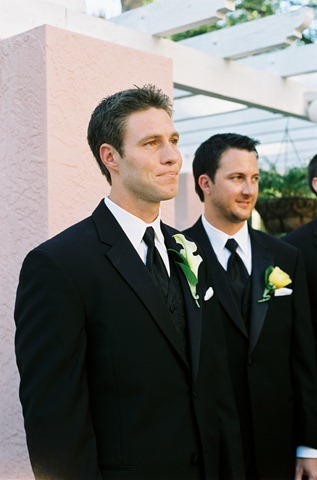 My groom cried. And so did I. And so did my dad. But we also laughed. Our wedding ceremony was all that I hoped it would be. As I said before in a previous post, I felt oddly calm as I got ready with my bridesmaids on our wedding day. I wasn’t nervous. I simply felt ready. I remember piling into the tiny hotel elevator with my six bridesmaids and my dad. I held onto my dad’s arm as my sister held my train. Everyone was chattering with excitement. Everyone except my dad. He had a calm smile on his face, but tears in his eyes. I squeezed his arm and he looked at me. "Are you ready?" I asked him. He nodded his head. We exited the elevator and lined up inside the hotel while Ryan, his groomsmen and our guests waited outside in the tea garden. At promptly 5:30 in the evening, our mothers were seated by Ryan’s best men. Back in the hotel, I told all of my bridesmaids how beautiful they looked. They had the biggest smiles on their faces. I literally squealed with excitement and anticipation. It felt amazing to be standing arm-in-arm with my father, looking at my best friends as they were about to walk down the aisle before me to Canon in D.
My sister was the last one to walk. 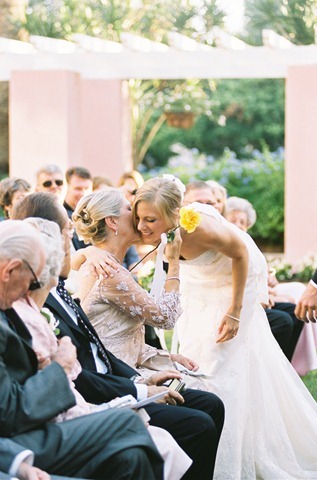 She looked at me and my dad and smiled, giving us a tight hug before heading down the aisle. Then the music changed. Wagner’s Bridal Chorus. 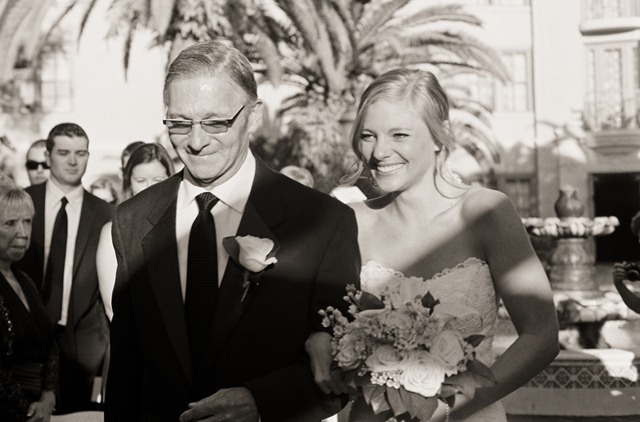 I looked at my dad, and squeezed his arm as he led me outside and down the aisle. I told him he was doing a good job as we slowly walked down the aisle. I couldn’t stop smiling. Once I locked eyes with Ryan, my eyes began to water. I couldn’t stop looking at him. He had tears in his eyes. I will never forget the way he looked at me that day for as long as I live. He was so strong through the rehearsal that I assumed he would handle the ceremony in the same way. To see him so emotional really moved me. After hugging and kissing my dad, I faced Ryan and held his hands as our pastor welcomed everyone and blessed our special day. Our pastor did an incredible job. His voice was loud and full of character and joy. During the beginning of the ceremony, we presented our mothers with roses to symbolize the merging of two families. In addition to the celebration of the love between Julie and Ryan, this wedding is also a celebration of family. It is the blending of two families, separate up to this moment, but united from this day forward. Julie and Ryan wish to honor this blending of the families by presenting a rose to their mothers — to thank their parents for the many selfless sacrifices they have made and for the unconditional love they’ve so freely given to their children. It was very important to us to recognize our mothers on our wedding day and we kept the presentation of a rose to each of them during our ceremony a secret. I love the look of surprise and emotion on my mother’s face in the above picture. And you can tell my dad is smiling beside her, which makes the picture all the better. Following the presentation of a rose to our mothers, our pastor spoke about the three things we love most about each other. 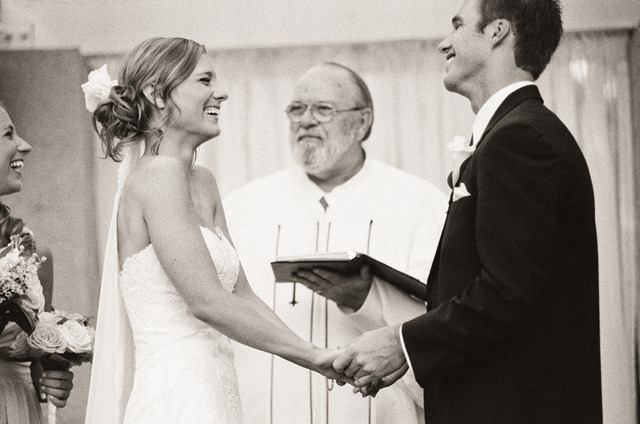 Our pastor kept the ceremony upbeat but still conveyed the emotion and love we felt that day. I remember feeling so grateful when it was time for the first prayer. Ryan and I looked up at each other as everyone bowed their heads. We wiped our eyes, smiled and mouthed "I love you" before praying with our pastor and guests. We got teary eyed again as our pastor read a poem we selected aloud and we repeated each line after him. Of this we are certain. Then it was time for our vows and the exchange of rings. I remember feeling like my whole body was shaking. I felt so vibrant and alive. 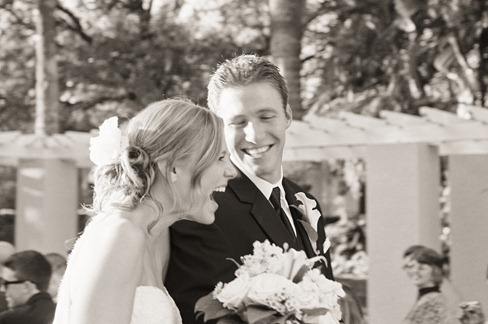 I was actually becoming Ryan’s wife! 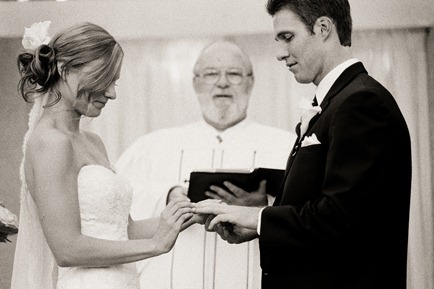 Before I knew it, our pastor was pronouncing us husband and wife and I was receiving my first kiss as a married woman. I was so happy. 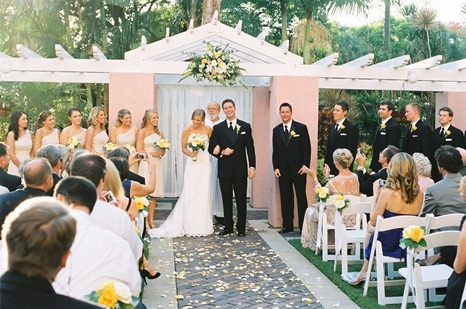 Arm-in-arm, we headed back down the aisle… officially married! I love that our photographer captured my first look at my parents before we headed down the aisle. We were all beaming. The above picture captures more emotion in a single image than I could ever hope to in a million words. We were so excited, so in love. Beautiful. I wish everybody could find a soulmate and experience this.